Re: Windows 10 Live Mail Tiles are not "LIVE"
Windows 10 Live Mail Tiles are not "LIVE"
I have to open the Mail app and read the e-mail. The live tile does not show anything though. Is the live tile supposed to show something or not? 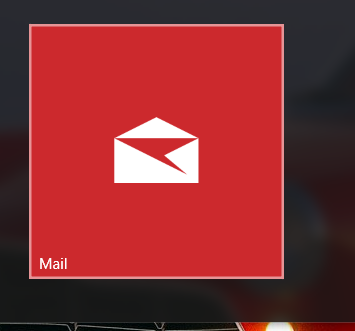 There is not much to the "Live Tile", although when switched to "Live", the tile should at least give you a number in the lower right corner to indicate the number of "new" emails in the Inbox. Right-Click on Mail Tile > More > Switch "Live" tile to "ON"
Click Thumbs Up to say Thank You! Answered? Click my post "Accept as Solution" to help others find it. The last little icon in the post editor is the Spell checker -- it is not great but it does catch the more obvious words. We are a community of HP enthusiasts dedicated to supporting HP devices and technology. Most of us were, at one time, able to spell at least a modicum number of words used in daily conversation. A bit of study improved the ratio -- and helped make us smarter. Smiling. Today, not-so-much. We are slaved to word-correct and spell-check applications.